Sanctuary of San Juan de Penyagolosa. 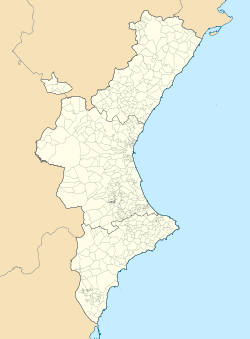 Vistabella del Maestrazgo (Valencian: Vistabella del Maestrat) is a municipality in the comarca of Alcalatén, Castellon, Valencia, Spain. It is bordered by the municipalities of Villafranca, Benassal, Culla, Benafigos, Atzeneta del Maestrat, Xodos, y Villahermosa in the province of Castellon; and Mosqueruela y Puertomingalvo in the province of Teruel. It is located in "El masis de Penyagolosa" and it is the highest municipality in the Valencian Community with 1,249 m of altitude. This page was last edited on 25 August 2018, at 21:24 (UTC).